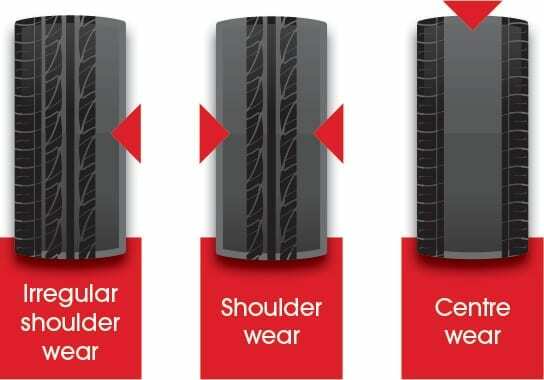 How to maximise the life of your tyres and stay safer on the road. Ensure your tyres have more than 1.6mm of treadMost new tyres start out with about 8-9mm of tread. When the tread wears, the tyre’s ability to disperse water reduces. Regularly check the indicators on your tyre’s tread pattern, which will show as lines across the tread when it’s reduced to 1.6mm. The tread on your tyres is what maintains your driving control, grips the road, disperses water and keeps you safe. A worn tyre increases the the time it takes you to brake in the wet, as well as your chance of losing control. Under or over-inflation is dangerous and can lead to excessive tread wear. Look for the manufacturer’s recommended tyre pressure, listed on the sticker usually located on the driver’s side door pillar or fuel flap, or have a tyre specialist inflate it for you. Check your tyre pressure using an accurate tyre gauge and when your tyres are cold. For heavy loads or sustained high-speed operations, increase the inflation pressures according to your vehicle’s recommendations. There is no set rule for what the age tyres should be replaced. However, some car makers advise against using tyres over six years old. Over time heat, sunlight and ozone can affect the tyre compound. To check the age of your tyres, look at the Tyre Identification Number (TIN). The last four digits indicate the week and year the tyre was made, for example, a tyre with TIN XXX4804 was manufactured in the 48th week of 2004. If in doubt, check with a tyre specialist at your nearest Bridgestone Select. Understanding tyre size is made easy with these pointers from the tyre experts. 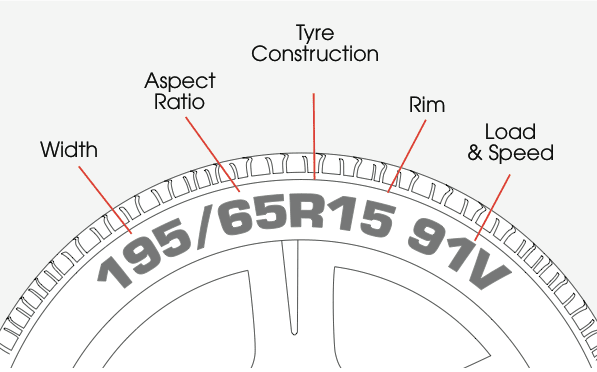 65 is a tyre’s aspect ratio which is its height from the base of the tread to the rim. This number represents a percentage of the tread width. For example, the height of this tyre is 65% of its width. Low profile tyres have a smaller aspect ratio percentages. All you need to know about tyres and more. Alignment basically means that all four tyres are consistent with each other and are positioned to optimise contact with the road. It consists of three elements – caster, camber and toe. The pressure of the air inside a tyre. Tyre pressure is measured in psi (see psi). Aspect ratio is section height divided by section width and multiplied by 100. The higher the figure, the higher the tyre’s section height, the smoother the ride. The lower the figure, the greater a tyre’s section width and the safer the tyre – best for high speed cars. Balancing a wheel (or tyre) ensures that the weight is evenly distributed. This prevents vibration and uneven tyre wear. Camber is the angle that the tyre tilts – 0 degrees means the tyre is perfectly perpendicular to the road. If it tilts in at the top towards the vehicle, the camber is negative. Positive camber is when the tyre tilts away from the vehicle at the top. The casing of a tyre is the outside part of a pneumatic tyre (i.e. not the inner tube). The pressure of a tyre before the vehicle is driven and the tyre is warmed up. An innerliner is a lining inside a tyre that prevents air leaking. The maximum weight a tyre can safely carry. Tyre markings are the symbols on a tyre’s sidewall to indicate (for example) load index. PSI is ‘pounds per square inch’ and is a standard measurement of pressure. Basically, it’s the amount of force exerted over one square inch. Normal tyre pressure is 32 psi. Rim and wheel are often used interchangeably – it is the part that the tyre sits on. The force required to maintain forward momentum in a straight line at a constant speed. Run Flat Technology tyres are designed to withstand punctures, thereby allowing the driver to continue to drive even when the tyre is completely deflated. The safety benefits are that it avoids the need for drivers to stop by the side of the road to change tyres and giving drivers ample time to make it home or to the nearest tyre replacement centre, provided they drive within the accepted speed limit and safe distance. The part of a tyre between the edge of the wheel and tread. Small slots in a tyre’s tread. The maximum speed a tyre can travel, corresponding to its load index. The rubber part that sits on the wheel. 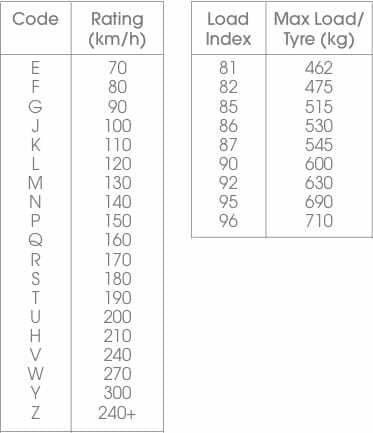 Tyre size is actually a set of numbers and letters that define a tyre’s specifications, such as section width (from sidewall to sidewall), aspect ratio, speed rating and diameter of the wheel the tyre is made to fit on. The raised part of the rubber on a tyre. Features built into a tyre to let the driver know that the tyre is worn sufficiently to necessitate changing. When a tyre is not inflated enough – it can result in a shorter lifespan and reduce fuel economy. Steering and cornering will be negatively affected and rolling resistance will be increased. Winter tyres are specifically designed to be used on winter roads – ice, snow and water.